The softest, chewiest peanut butter cookies you’ll ever eat. 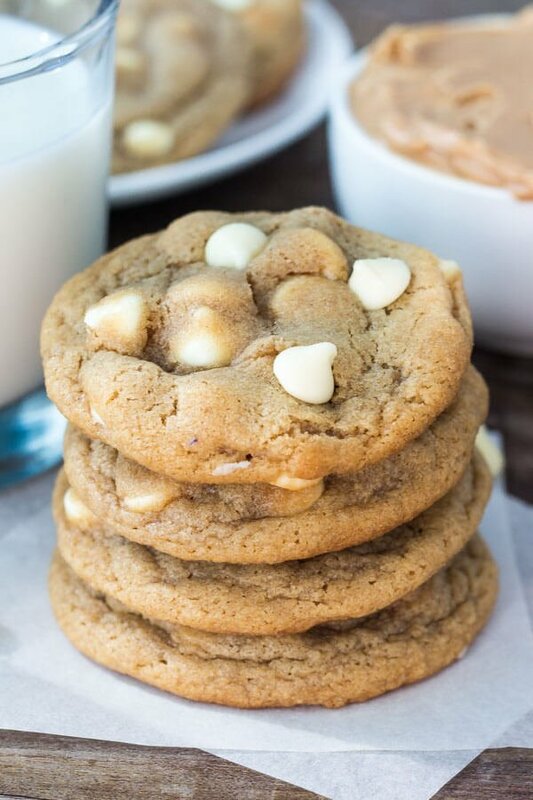 A perfect combo of sweet and salty – these peanut butter white chocolate chip cookies taste just like biting into a white chocolate peanut butter cup! Do you love peanut butter? I’m a true peanut butter lover. Peanut butter and jelly, peanut butter smoothies, peanut butter muffins, Reese’s peanut butter cups… I could go on for days. Needless to say, I realized it’s been months since I made peanut butter cookies. None. Nada. Zip. Totally unacceptable Fiona. So let’s start the peanut butter recipe train with a classic – Peanut Butter Cookies. Only we’re switching them up and making peanut butter white chocolate chip cookies. If you’re anything like me, peanut butter cookies are impossible to resist. Big peanut butter flavor, super soft, endless mix-in options. What’s so great about peanut butter is that it creates the perfect combo of salty and sweet while keeping cookies soft and tender. There’s no way to resist. 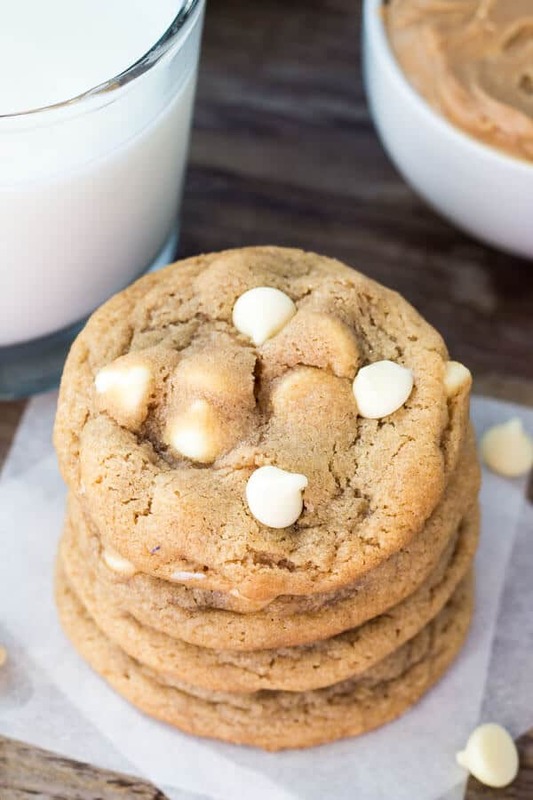 For these peanut butter white chocolate chip cookies, you’ll start by creaming together the butter, peanut butter and sugar. You’ll use more peanut butter than butter for big peanut butter taste and just brown sugar to keep them super moist and chewy. Then mix in the egg and vanilla, followed by your flour and leaveners and Ta-Dah! Perfect peanut butter cookie dough. I couldn’t stop there though. There was a lonely bag of white chocolate chips in my cupboard yearning to be made into cookies. So, in they went. The results are perfect. Turns out, white chocolate is delicious with the peanut butter. 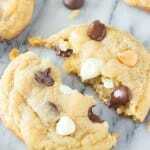 The last secrets to super chewy peanut butter white chocolate chip cookies? First, chill the dough! If not, your cookies will spread and become too crispy. Then under bake – about 8 to 10 minutes depending on your oven. The tops won’t be totally set yet, but that’s how you want them. It’s like biting into a white chocolate peanut butter cup. 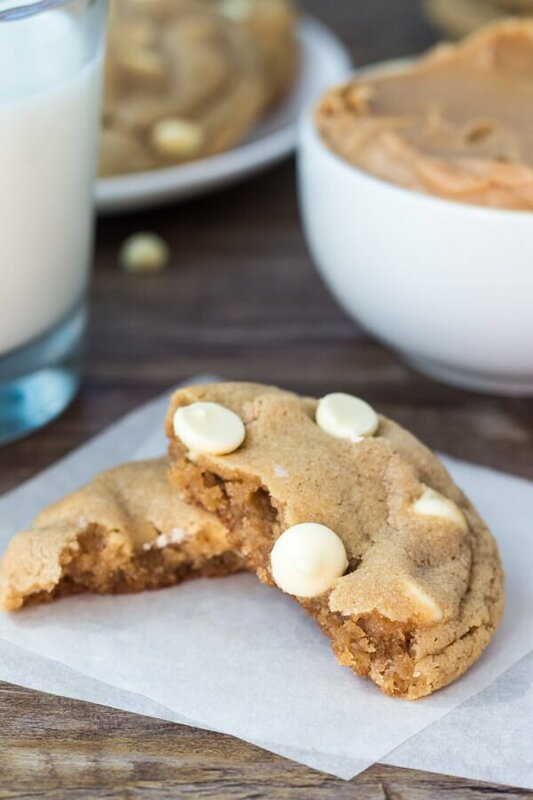 These peanut butter white chocolate chip cookies are AMAZING – so soft, lots of peanut butter taste and the perfect balance of peanut butter butter and white chocolate. You’re going to be wishing you made a double batch! Plus – check out this video I made of how to make these delicious cookies! The softest, chewiest peanut butter cookies you'll ever eat. 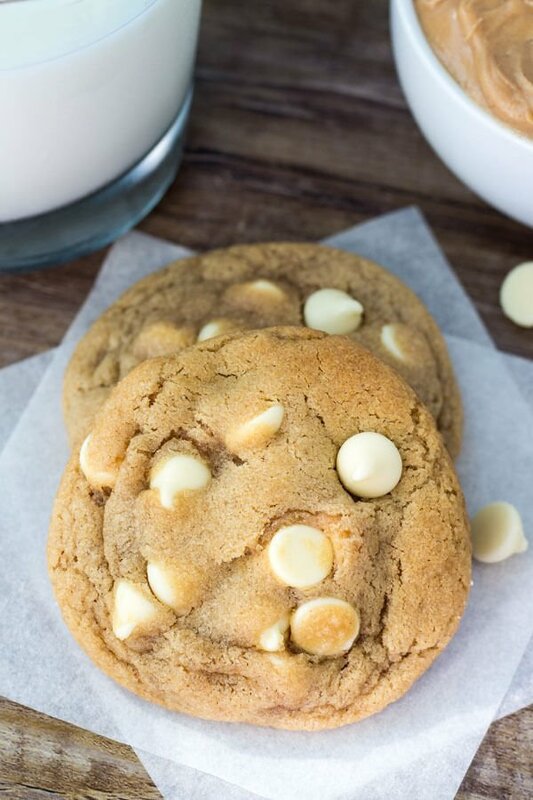 A perfect combo of sweet and salty - they taste just like biting into a white chocolate peanut butter cup! In a large bowl using an electric mixer, cream the butter and peanut butter on medium speed until combined. Add in the flour, baking soda and salt and mix on low speed until combined. Turn of the mixer and fold in the chocolate chips with a large rubber spatula or wooden spoon. Cover and chill in the refrigerator for at least 2 hours or up to 2 days. When ready to bake, preheat the oven the 350F degrees. Form dough into balls about 1 1/2 to 2 tablespoons in size. Place 2 inches apart on a baking sheet lined with parchment paper or a silicon baking mat. Bake cookies for 8-10 minutes. The tops will not be completely set. 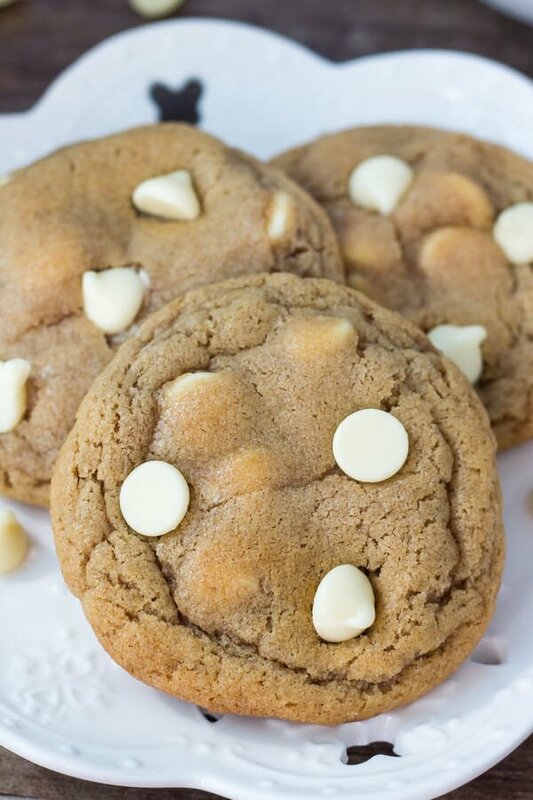 Place a few extra white chocolate chips on the top of each cookie. Cookie dough balls can be placed in a zipper-locked bag and frozen.